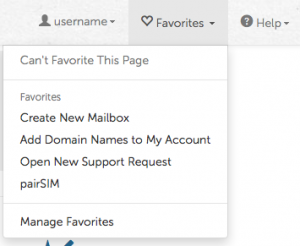 The favorites menu is where you can favorite or unfavorite the page you're on, jump to any of your favorited pages, or go to the Manage Favorites interface. All of the pages that you have favorited will appear on the ACC homepage with an icon and the name of the favorited page. The Manage Favorites interface is where you go to change the order that your favorited pages appear in the favorites menu and on the homepage, or to delete individual favorited pages. You can favorite the page you're on by opening the favorites menu and selecting Favorite This Page. If a page has already been favorited, the icon for the favorites menu will change from an unfilled heart to a filled, red heart. You will not see the option to favorite a page that has already been favorited. As you favorite pages, they are added to the bottom of your favorites list and the end of your favorites grid. You can quickly navigate to any of your favorited pages either by selecting the page from the favorites menu or by selecting the page from the grid of favorites icons on the ACC homepage. You can manage your favorites to remove pages that you no longer want in your favorites list, and to change the order in which favorites appear on the homepage or in the favorites menu. Open the favorites menu on the ACC navbar. In your list of favorites, find the page you wish to remove. Click on the trashcan icon for that page's entry. In your list of favorites, find the page you wish to move. Click on that page's entry and drag the page to the desired position within the list.